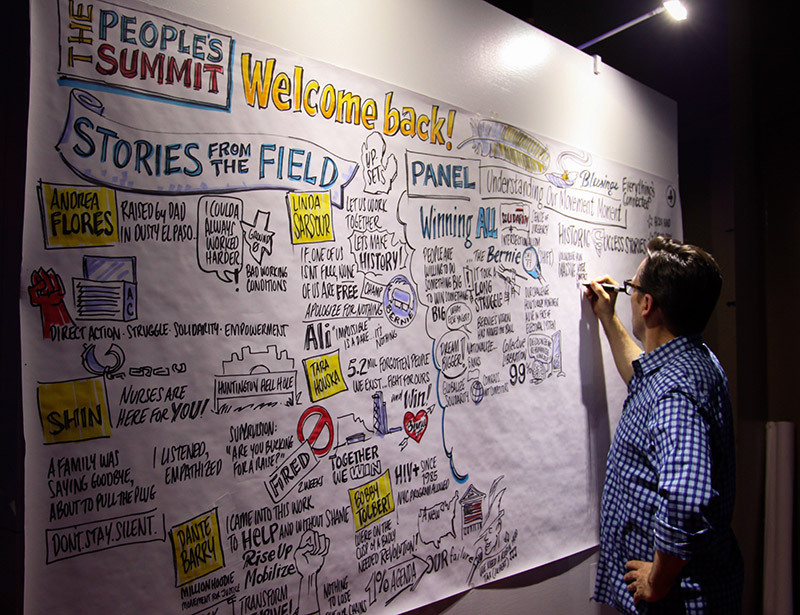 The People’s Summit wasn’t perfect—but it was a start. I felt like I was at the Conservative Political Action Conference (CPAC), and it felt pretty good. Not that I’ve ever been invited to CPAC, but the People’s Summit was a bit like what I’ve always imagined right-wing gatherings to be: better funded and organized than the usual left affair, with great sizzling appetizers. With more than 3,000 people in attendance, the conference managed to fill an impressive chunk of Chicago’s McCormick Place convention center. There were big screens broadcasting plenary sessions, fancy lanyards and an interactive app for conference goers, and the catering was on point. No open bar—but, hey, this isn’t full communism yet. The National Nurses United (NNU)-led effort aimed to extend the Bernie Sanders moment by bringing together organizations “rooted in principled anti-corporate politics.” I’d agreed to speak on a socialism panel, but I confess to a slight fear that the event might be similar to the 2010 One Nation Working Together rally, the labor movement’s response to the Tea Party. One Nation was well-intentioned, but felt like a top-down attempt to summon the spirit of a grassroots movement. The attendees of the People’s Summit, however—even the union’s staff—all seemed eager to be there. Part of what made the gathering so much less depressing than One Nation, aside from the fortunate absence of a keynote address from blowhard Ed Schultz, was the politics and energy of RoseAnn DeMoro, the NNU’s executive director. In the opening speech, DeMoro spoke powerfully and was keen to criticize the Democratic National Committee (DNC), Hillary Clinton and even capitalism itself. “We need to restore the power of labor in relation to capital,” she argued to applause. If only more union leaders had that clarity. Though other key Sanders-supporting unions were conspicuously absent, the event felt vital in a way large labor gatherings usually don’t. The union turned out rank-and-file workers, and partners like People’s Action and People for Bernie attracted younger activists. The overriding tenor was optimism. Speakers like actor Rosario Dawson implored the audience to take stock of all that has been accomplished since Sanders announced his candidacy to an empty National Mall. Within months, he was matching Clinton in fundraising and speaking to crowds in the tens of thousands. There is plenty to celebrate—and the often dour Left can always use a bit of optimism. Winning begets winning, and hard work should be acknowledged. However, this mood at times deferred hard questions, foremost among them: What does it mean to be a “Sanders Democrat?” And how can our new movement differentiate itself from mainstream American liberalism? There are not necessarily any right answers to these questions, but some contending ones would have been worth exploring. As it was, these questions were only unintentionally brought to light by the tensions between some of the speakers. There is no doubt that we have a more favorable starting point today for building left politics than we could have imagined a year ago. Thousands are looking to follow Sanders’ lead down ballot and many more are politically engaged for the first time. Without a rigorous discussion about the failures of past efforts to reform the Democratic Party and potential strategic readjustments, however, we’re likely to see a continuation of what’s emerged in recent months: the Sanders brand attached to a motley assortment of party dissidents. Some, like prospective New York state senator Debbie Medina, are quite impressive, with real track records of organizing. Others, like Summit speaker Tulsi Gabbard, an Hawaiian congresswoman who resigned as DNC vice chair to endorse Sanders earlier this year, are far less so. Gabbard used the conference’s platform to give a speech heavy on foreign policy that reiterated talking points about how Clinton’s hawkishness on Syria is a distraction from an undefined “good” war on terror. It’s not clear what unites Gabbard, who has spoken at events for India’s nationalist Bharatiya Janata Party, with leftists other than a mutual dislike for the Clinton machine. That might be enough for a tactical marriage of convenience, but it’s not enough to warrant her elevation at a left-wing event. Not in attendance, but indicative of the problem, was Tim Canova, who is challenging controversial Clinton supporter and DNC Chair Debbie Wasserman Schultz for her congressional seat. Canova hits some sound notes on economic policy, but is also attempting the difficult feat of outflanking Wasserman Schultz on Israel from the right. New candidate recruitment initiatives like Brand New Congress are unlikely to solve the problem. Brand New Congress frames its campaign as a call to elect an “honest, accountable Congress to enact Bernie’s program” but it lacks any organic base in communities and workplaces. It’s hard to believe that it’ll be able to enforce candidate accountability or provide the political foundation to ground electoral efforts. So where will this coherence come from? One potential starting point that emerged was a repudiation of liberalism. The warm reception to RoseAnn DeMoro’s warning that “liberals are usually bad, they usually sell you out when you think they’re with you” was proof that the attendees didn’t consider themselves liberals. When I was a campus activist five years ago, people used to ask me questions like, “Isn’t being a socialist like being really, really liberal?” They meant it as a compliment; it was horrifying. Now, “liberal” is back to being a term of abuse—and not just on Fox News. Though it’s led to (if you believe reports from media pundits) a world-historic bloodletting on Twitter, this was one of the most promising developments out of the Sanders campaign. It was a manifestation of a longstanding fissure between the rank-and-file of the Democratic Party—many of whom would like the party of the New Deal and Great Society back—and the technocrats at the helm of it. You could feel this new disdain for liberalism and a desire to go beyond it in the air at the People’s Summit; where it will go next is unclear. It’s a divide that could lead to apathy as people lose faith in the ability of politics to change lives for the better, or it could pave the way for a militant new force to the left of liberalism. Much will depend on whether radicals in the Sanders movement can provide useful leadership. The L-word is out, but it’s not clear what will take its place. Socialists were well-represented on the ground, with a visible presence from the Democratic Socialists of America, the International Socialist Organization and Socialist Alternative, but we failed to impress when given the stage. In this disappointment, I am very much implicated. I was part of a panel on democratic socialism with Frances Fox Piven and Seattle’s socialist councilperson Kshama Sawant. We spoke to a large, young crowd, many of whom, I would later learn, were unfamiliar with socialism aside from fleeting references during the Sanders campaign. Piven implored the audience to focus on movements, considering much of socialist organizing to be a distraction from the more important tasks of day-to-day movement building. It seemed reasonable, but the vague way “movements” were invoked would almost lead someone to believe that movements can materialize out of nothing, and continued the trend of overstating the size and reach of the movements we do have. Of course, without the leadership and organizing capability of socialists, few of the great struggles of the 20th century, from 1930s labor organizing to the civil rights movement, would have been as successful. Building socialist cadre and training people (albeit in a non-sectarian way) is no roadblock to progress—in many ways, it’s a prerequisite. The organizational drive of conservatives to make their ideas count, to make their policy preferences felt, year in and year out, within the Republican Party, and at every level of government, is a model worth considering. A brief question-and-answer period ended when a member of the Spartacist League, a tiny Trotskyist organization, took the opportunity to denounce everyone on the stage and Bernie Sanders. Apparently, we all had traveled back in time and murdered Rosa Luxemburg without realizing it. With that, the meeting was adjourned. If I were a socialist-curious young person before attending the panel, I might not have been afterward. Nor was the charismatic John Nichols’ intervention during the opening plenary session particularly useful. Nichols discussed the legacy of Socialist Party leaders Eugene V. Debs and Norman Thomas. Debs and Thomas may have lost, he argued, but their struggle was ultimately won because many of their demands found fruition in the New Deal. It was as if the Roosevelt administration—one that clashed with radicals for years—was a perfect embodiment of socialist politics. Nichols’ argument pointed to one of the problems with the Sanders movement’s use of the word “socialism” as a catch-all for everything from snowplows to the Department of Motor Vehicles. It’s not the worst entry point, but without more rigor and education, we’ll lose track of the true meaning of socialism: not “stuff the government does,” but worker self-organization and democracy from below. Yes, it’s the United States, and yes, it’s 2016, but the challenge of our politics is to make that aspiration of socialism relevant, not to give up on it and claim victory anyway. Such messiness, however, should be expected. As should the fact that no permanent organization or set of strategic conclusions came out of the event. After all, we were just getting to know each other. 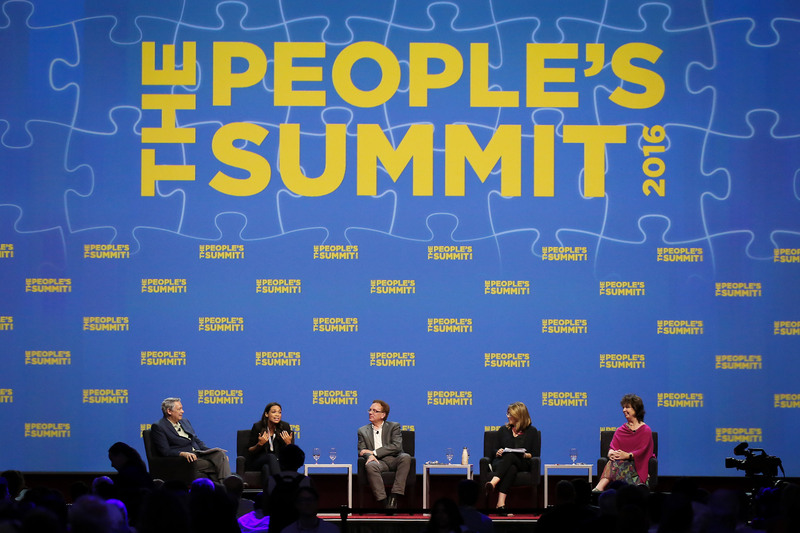 The People’s Summit was much like the Sanders campaign: not the beginning of a movement, not the middle and not the end, but an example of the terrain in which the Left operates. Millions of people are attracted to a broadly social-democratic message, are discontent with mainstream political offerings, and are not afraid of exploring radical ideas. It’s up to us to take advantage of the moment. Socialists mingled with labor activists and union staff connected with environmental groups—the People’s Summit was a warm and friendly affair. Maybe my judgment was impaired by all the high-end finger food, but for all of its faults, it was worth the trip. I walked away from it more optimistic about the future than I have been in a long time. It could have been much more—something that figured out a way to tackle the strategic questions that plague our movement with a minimum of divisiveness. It’s a difficult task, but it’s one we’ll have to take on at some point. This is part of an ongoing series on the political revolution sparked by the Bernie Sanders campaign, and the impact it's having beyond the election.